Last week's stock market advance placed prevailing conditions firmly back to an overvalued, overbought, overbullish, rising-yields syndrome that has historically been hostile for stocks, on average. Our investment stance considers not only these factors, but also reflects the (present) accommodative stance of monetary policy, as well as a broad range of measures such as market internals, credit spreads, and economic statistics. I've noted before that as rules of thumb go, "the trend is your friend" historically performs better, with much smaller drawdowns, than "don't fight the Fed" (regardless of how that rule is defined operationally). While the market tends to perform better when both are true, the exception is the overvalued, overbought, overbullish, rising-yields syndrome, which is uniformly negative regardless of the random subset of historical data one examines. There is certainly a tendency for "unpleasant skew" featuring a persistent series of marginal new highs for some period of time, but on average, those are ultimately overwhelmed by steep and abrupt losses that finally clear this syndrome. It's important to recognize that our present investment stance reflects these observable conditions, and is not driven by our views about the underlying state of mortgage debt, fiscal challenges, economic forecasts, expectations of credit strains, or any view about the appropriateness of Fed intervention. We do try to look ahead to some of the risks that may emerge in the quarters ahead, but our investment stance is not driven by this analysis. If we can clear some component of the observable, hostile syndrome of market conditions - probably either the overbought or overbullish feature - without a substantial breakdown in market internals (which would take us "out of the frying pan and into the fire"), we expect to quickly establish a moderately constructive investment stance. Our concerns regarding larger economic risks can be sufficiently expressed by holding a continued line of index put options to defend against any unanticipated continuation, but again, barring a breakdown of market internals (which would suggest a larger and possibly more durable shift toward investor risk aversion), I expect that clearing the present, hostile syndrome will be sufficient to accept a greater exposure to market fluctuations. Our longer-term analysis remains that the S&P 500 is priced to achieve poor 10-year total returns, but that in itself doesn't resolve into the requirement to carry a persistently defensive position over the short- and intermediate-term. Even if the market remains overvalued and economic risks persist for a long time, we do expect that the "ensemble" solution to the "two data sets" problem we struggled with in recent years will result in more frequent periods of moderate investment exposure than we observed during that period. Still, our dominant investment horizon remains the full market cycle, so our usual "anti-marketing" applies - the Hussman Funds are not appropriate for investors who have a strong desire to track market fluctuations or whose investment horizon is shorter than a full bull-bear cycle. That said, even for investors who prefer to track the market up and down to a reasonable degree, it is worth emphasizing that combining a long-only approach with less correlated approaches that still compete well over the full cycle can significantly improve the return/risk profile of the portfolio over time. Last week, a number of Fed officials came out in tandem with essentially the same message - the Fed's policy of quantitative easing is likely to end with QE2. It's important to think carefully about the implications of this for the markets. My impression is that investors are still in something of a "momentum" mentality both with respect to the market and the overall economy, and it's not clear that they've pieced out the extent to which this has been reliant on various stimulus measures that are now drawing to a close. It is clear that the effect of QE2 has not been to lower interest rates, or to materially expand credit. Rather, QE2 has been built on two blunt forces. The first is that increasing the stock of non-interest bearing money in the economy toward $2.4 trillion, all of which has to be held by somebody, the Fed has created a market environment that has raised the prices and lowered the returns on all competing assets in order to accommodate that equilibrium. As asset prices are bid up, their expected future returns fall, and the process stops at the point where on a risk-adjusted basis, no asset is expected to achieve returns that compete meaningfully with cash (at least over some horizon of say, a year or two). The second force has been purely rhetorical. The opening salvo in QE2 was Bernanke's public endorsement of risk-taking in the Washington Post. Strikingly, he has seemed to eagerly take credit for the speculation in the stock market, particularly in small cap stocks, while denying any culpability for the commodity hoarding and dollar weakness that predictably results from driving real short-term interest rates to negative levels. Charles Evans (Chicago Fed) "Following through on that to the tune of $600 billion, like we've said, I think is appropriate. I personally don't see as many needs for a further amount, as I probably thought last fall." James Bullard (St. Louis Fed): "The economy is looking pretty good. It is still reasonable to review QE2 in the coming meetings, especially this April meeting, and see if we want to decide to finish the program or to stop a little bit short." Charles Plosser (Philadelphia Fed): " If this forecast is broadly accurate, then monetary policy will have to reverse course in the not-too-distant future and begin to remove the massive amount of accommodation it has supplied to the economy. Failure to do so in a timely manner could have serious consequences for inflation and economic stability in the future. I don't think that is necessarily imminent, but we have to be very careful we don't get behind the curve. I worry about us getting behind the curve. " Richard Fisher (Dallas Fed): "In essence what we have done as a central bank is to monetize the entire US debt through the end of June. Had I been a voter last year, which I am this year, I would have joined Hoenig and would have voted against what is known as QE2. In my opinion, no further accommodation is needed after June -- either by tapering off the bottom of the purchases of Treasuries, or by adding another tranche of purchases outright. In my view it is unlikely that we will have or need more accommodation by the central bank. I think we've done our job." While the possibility of ending QE2 early may come up in the FOMC's April meeting, I doubt that the Fed will stop short. Regardless of the lack of meaningful "wealth effect" from stocks to GDP in the historical data, it's clear that Bernanke views a speculative stock market as a good thing, and my impression is that he would consider the risk of disappointing the markets as too great. Instead, the Fed will have enough on its hands simply removing the expectation of the market for QE3, not to mention telegraphing the potential for the Fed to eventually reverse course. Still, barring a surprise early-conclusion to QE2, there are two important issues for the market as we look ahead to gradual changes in Fed policy. First, what happens when QE2 is complete? From our standpoint, it is incontrovertible that the primary factor behind the market's recent advance has been speculation based on the belief, explicitly encouraged by Bernanke, that the Fed would provide a backstop for risk-taking. Investors clearly took Bernanke at his word. But without yet another round of QE, not to mention the potential for an unwinding of existing QE, a decline in speculative enthusiasm will likely have the identical effect as an increase in risk aversion. Second, how likely is it that economic growth will be successfully "handed off" to the private sector as fiscal policy tightens and monetary policy becomes less aggressive? It is clear that the economy is enjoying some surface economic progress - the most notable being a gradual drop in new claims for unemployment. But the real fiscal "cliff" for states and municipalities doesn't hit until about mid-year, which is the same time that QE2 comes off. What we're observing at present is decidedly still fiscal- and monetary-induced growth. It is not enough that the data have improved gradually. The real question is whether it would have, or will, improve without that stimulus. On the employment front, it is important to recognize that while the annual growth of non-farm payrolls averaged about 2% and higher prior to the 1990's, each cycle of U.S. economic expansion and recession has resulted in slower and slower long-term employment growth. The chart below shows what I would characterize as a series of "vicious cycles" - particularly the most recent experience. On the chart, business cycles move counter-clockwise, with expanding year-over-year employment growth gradually improving the 10-year average, followed by a slowdown and eventually a contraction in employment growth that since the 1960's has dragged long-term employment growth to progressively lower levels in each successive business cycle. Given the high level of unemployment, the "mean-reversion benchmark" would normally be about 200,000 jobs monthly. We should sustain that for a few more months, but the likely effect of reduced policy stimulus should not be ignored looking out further. The bottom of the chart is where we are at present. In my view, the poor performance of the U.S. economy from an employment standpoint cannot be separated from the Fed's attempts, for more than a decade, to make easy monetary policy a substitute for the accumulation of real savings and investment. All that we've done is to finance a huge stream of consumption, which we have quietly paid for by selling off claims on our assets and future output to foreign savers such as China and Japan. The Fed has surely helped us to build that indebtedness without pain from an interest rate standpoint, but the volume of claims is increasingly onerous. Unlike Japan, which has a high debt-to-GDP ratio but finances the bulk of it with its own savings, our debt is increasingly external, which means that someone else has a claim to our future output. Speculating and consuming off of cheap credit may feel better than saving, but the long-term results are profoundly different. The problem for the financial markets here, in my view, is that the benefits of the speculation are now largely behind us. Our valuation models do assume that long-term growth in GDP and earnings will persist at the same roughly 6.3% peak-to-peak growth rate across economic cycles that has characterized the earnings channel for nearly a century. Yet given the level of stock valuations to normalized earnings - which better reflect the long-term stream of cash flows that investors can expect to receive - our present 10-year total return estimate for the S&P 500 is only about 3.4% annually (and to Mish, yes, the historical skew to these returns easily includes zero in the confidence interval). None of this rules out further positive market returns over shorter periods, and we remain willing to accept moderate periodic exposures even here, provided that we can clear some component of the overvalued, overbought, overbullish, rising-yields syndrome we presently observe. But as Charles Dow said a century ago, "to understand values is to understand the meaning of the market." Occasional prospects for moderate exposure notwithstanding, I continue to view the long-term prospects for equities as weak. This is largely because we continue to rely on band-aids and overwhelming policy interventions to keep interest rates low and market valuations elevated, in preference to lower valuations (and commensurately higher interest rates and prospective equity returns) which would offer proper incentives to save and allocate capital for productive long-term uses. As of last week, the Market Climate for stocks reflected a continued hostile syndrome of conditions that holds us to a well hedged investment stance in both the Strategic Growth Fund and the Strategic International Equity Fund. In bonds, the Market Climate remained characterized by relatively neutral yield levels as well as neutral yield pressures. The Strategic Total Return Fund continues to carry a duration of just over 4 years, with about 10% of assets allocated to precious metals shares. As I've noted before, very shallow corrections in gold followed by moves approaching the $1500 level would be consistent with increasing hazard risk, so I would expect that we'll tend to lighten our holdings on any "range expansion" moves in precious metals shares (large leaps in price that have a wider overall range than that of preceding weeks). For now, we're moderately constructive in both bonds and precious metals. We are defensive in stocks, but that would change on a decline sufficient to clear overbought, overbullish conditions without being severe enough to materially damage market internals (which would signal more a more significant shift toward investor risk aversion). As always, we'll respond to changes in market conditions as they emerge. As many of our shareholders know, the Hussman Foundation is involved in a broad range of charitable projects which include medical research, education, neglected diseases, and autism, among others. A few years ago, my friend Paula Kluth and I produced a documentary called We Thought You'd Never Ask - Voices of People with Autism, which aired nationwide on PBS. That documentary included a number of people on the autism spectrum, both verbal and nonverbal, including two friends of ours, Jamie Burke and Sue Rubin, both who type independently to communicate (Jamie has gradually developed the ability to speak as well, but the complexity of his sentences is still much greater when he taps on a surface or even on an open hand as if it's a keyboard - amazing how the brain works). 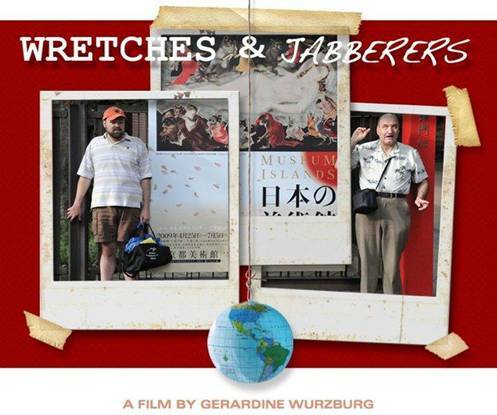 Given the impact of that work and the feedback we received, the Foundation has produced a full-length film called Wretches and Jabberers, in conjunction with the Institute on Communication and Inclusion at Syracuse University, and directed by Gerardine Wurzburg, who has a whole list of wonderful films to her credit, including "Educating Peter." April is Autism Awareness Month, so beginning on Friday, the Autism Society of America and AMC Theatres have partnered with us to show the documentary in over 40 theatres across the U.S. and Canada. There will be a week-long engagement in New York and Los Angeles, and numerous individual showings in cities across the country. We also understand that AMC will extend the showings if there is broad interest. If you have a friend or relative affected by autism, we hope that the film will offer a new perspective and begin a dialogue about the competence and acceptance of people with autism. Composer J. Ralph wrote the score for the film, and a number of artists including Norah Jones, Carly Simon, Scarlett Johansson, Stephen Stills, Ben Harper, Bob Weir, and Judy Collins generously donated their time and performances for the soundtrack. As a side note, the title comes from a remark made by Antti, a young man from Finland with autism (where the word "wretch" is used - as in Old English - to describe someone who is treated as an outcast and excluded from society). A number of people in the film are or have become personal friends, and Larry Bissonette (the man to the right in the photo above) is a riot. Take a look at the schedule - it would be great to fill all of those theatres.